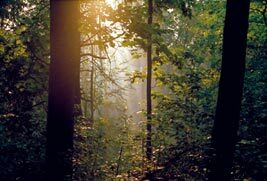 The structure and plant composition of forests change over time in a process called succession. In forest succession a grassy field or clearcut will eventually become a mature forest. Certain wildlife will be favored in forests at different stages of succession because of the types and amounts of habitat that are provided by that stage. For example, early-successional forests have more fruit, seeds, and woody browse but less nuts, acorns, and cavity trees than older forests. Depending on the type of management that is applied to your land, you will be creating or maintaining different successional stages of forest and, as a result, providing habitat for different groups of wildlife. 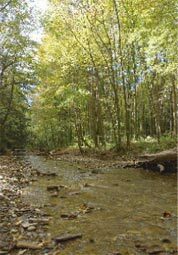 Protecting forests along streams keeps fish and wildlife habitat healthy. There are two approaches to forest harvesting: even-aged and uneven-aged management. Even-aged forest management removes most overstory trees from a stand (like clearcuts) and produces stands that are dominated by one age class as they regenerate. These methods work best when you are trying to regenerate trees that are not tolerant of shade, such as oak. Uneven-aged management creates stands with at least three tree age classes by cutting scattered individual trees (single-tree selection) or small groups of trees (group-selection). Shade-tolerant tree species, like maple and beech, regenerate best in these stands. Choosing not to harvest and relying on succession also can be a good option in some situations. However, recognize that this approach is similar to harvesting in that some wildlife will be favored (e.g., late successional species) whereas others will decline (e.g., early-successional species). Based on your goals, the type of forest you have, and other site characteristics, a professional forester or biologist can suggest which method is appropriate for your land. Although these management approaches differ greatly in which wildlife are favored, both early and late successional species are important from a conservation standpoint. Woody debris is a natural and important component of forest habitats. Protect unique or important habitat features. Harvesting trees or locating high-use facilities near unique habitat features, such as small ponds, temporary pools (vernal pools), rocky outcrops, and seeps, can destroy the habitat they provide. If possible, do not disturb the forest within at least 100 feet of these important habitat features. Enhance the vertical structure of the forest. Keep understory and midstory vegetation intact. Forest animals usually specialize on particular “layers” of the forest, depending on these components for foraging or nesting substrates. Although removing shrubs and saplings creates an open, park-like structure, it will prohibit some understory-dependent species from using the area. Maintain forested buffers along streams. Riparian habitats perform critical ecological functions, as well as provide habitat for a rich diversity of flora and fauna. Removing trees adjacent to streams not only destroys riparian habitat for terrestrial wildlife but also harms aquatic habitat by increasing water temperature and sedimentation. To reduce the negative impacts, leave buffer strips of unharvested trees (at least 50 to 100 feet wide) along both sides of streams. Remember to keep roads and heavy-use trails at least 50 feet away from water and minimize the number of stream crossings for roads. The wider the buffer, the more beneficial it will be for wildlife and erosion control. Overstory trees in harvested areas are used by a variety of birds for foraging and nesting. Retain decaying and dead trees (snags). Tree cavities provide shelter, dens, nests, and foraging sites for many wildlife species. For wildlife use, snags should be greater than 8-inch diameter breast height (dbh). Leaving all standing dead trees is best for wildlife, but at least one large (greater than 18-inch dbh) cavity tree per few acres is needed for larger species that use cavities, such as wood duck, pileated woodpecker, and mergansers. Beech, basswood, and aspen are generally good cavity-producing trees. Also, some damaged young trees also can be reserved to provide future cavity trees. Trees with fungal conks, dead branches, old scars, and soft or decaying wood (especially heartrot) are good indicators of cavity potential. If you are concerned about safety issues, a professional forester can evaluate safety threats posed by a particular snag and then recommend actions that you can take to minimize the risk. Keep dead and down wood on the forest floor. Many animals, especially salamanders and small mammals, use logs, slash, and other woody debris for cover, dens, nests, foraging sites, and even as places for courtship displays. If possible, leave large logs that will last longer than small logs. 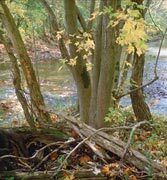 You may want to leave some woody debris in piles to prevent quick decay, especially in wet sites. These brush piles can be placed anywhere but are most useful near edges, food sources, water, or areas with little cover. If you are harvesting, retain some overstory trees. Live overstory trees, retained both individually and in small groups and in a variety of species and sizes, provide perching, nesting, and foraging opportunities to wildlife. In addition, by retaining at least one individual tree of every species on your land, you increase the probability of some seed production every year. Sometimes retaining a single mature tree of a species uncommon to your woodlot can preserve wildlife values not provided by a common tree species. Making special efforts to retain trees that produce mast (fruits, nuts, and seeds), such as beech, oak, cherry, and dogwood, will be beneficial to many forest wildlife. Small groups of conifers (evergreen trees like pine and hemlock) also can provide important cover from snow and cold temperatures during the winter months. An example of a feathered, gradual forest edge. Shrubs can similarly help to soften edges. Create feathered and meandering edges rather than straight or abrupt edges. An edge is where two different types of habitats meet. Edges can be abrupt, like the interface of a tall forest and a farm field, or they can be gradual and feathered, like a forest grading into a shrubfield and then a meadow. Some wildlife, such as salamanders and certain forest birds, avoid using abrupt edges, and those that use them may experience high rates of predation. Edges can be associated with higher amounts of nest predation, fewer food resources for some species, warmer air and soil temperatures, drier conditions, and more wind than interior forest. Abrupt and highly contrasting edges generally have more of these negative “edge effects” than gradual or low-contrast edges. Low-contrast, gradual edges can be made by allowing shrubs, saplings, and some overstory trees to remain along the forest boundary. Edges can be feathered by retaining more trees, shrubs, and saplings closer to the forest interior and gradually fewer trees closer to the open area. Be sure that the feathered edges add to rather than subtract from your forest patch area (i.e., they make the forest stand larger rather than smaller). Try to maximize the “interior” of your forest stands. Forest interior is unbroken forest at least 300 feet from habitat edges and usually is positively related to the size of a patch of forest (i.e., the larger the patch size, the more forest interior there is). To maximize the amount of interior forest, leave the largest patch of uncut forest possible. You also can cut around the borders of a forest stand rather than fragment the stand into smaller ones. Try to keep disturbances, such as improved paths and roads, from bisecting your forest patch. Circular and square-shaped forest patches retain more forest-interior than oblong, rectangular, or irregularly shaped patches. Do keep in mind that a small patch is usually better than no patch at all. Even small patches can provide habitat for some common species and, possibly, migrating birds. Forests often have distinct layers of vegetation in the understory (usually lower than 10 to 15 feet), midstory, and canopy. Encourage the growth of oaks, hickories, and other mast-producing species in eastern forests. Throughout much of the eastern United States, forests are shifting from oak-hickory composition to shade-tolerant stands of maple, cherry, or tulip. Because these shade-tolerant species do not produce hard mast, nut and acorn food resources for wildlife might decline in abundance. Oaks and hickories generally require full sun conditions to regenerate. Protecting seedlings and saplings from heavy deer browsing and using prescribed burning in young stands may also promote regeneration. A professional forester can best guide management activities aimed at regenerating these species.